'For you, the war is over.' These famous words marked the end of the Second World War for nearly half a million allied servicemen, and the beginning of a very different battle in captivity. Waged against boredom, brutality, disease, hunger and despair, it was a battle for survival, fought without the aid of weapons against fully armed enemy captors. 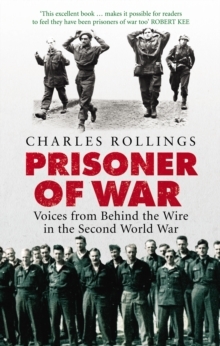 Based on interviews and correspondence with ex-POWs and their relatives over the last 30 years, Prisoner of War is a major survey of allied POWs from all walks of life. Extraordinary stories of extremes: courage, hope and desperation are revealed in the words of those that were there. Arranged chronologically, the book follows those involved from capture, through interrogation, imprisonment, escape, to final liberation and homecoming. POWs and, in particular, those who broke free, have become a post-war cultural icon; a symbol of the will to survive against the odds. Rich with incident and emotion, Prisoner of War is a compelling look at the lives of extraordinary individuals trapped behind the wire.